Gameplay: Ankh is a point and click third person game. The main menu has New game, Load, Settings, Credits, Quit game and later, Continue game. The settings page has brightness, screen resolution, texture quality, shadows, effects, music volume, sound volume and subtitles selections. The cursor over an object shows an action stated at the bottom of the screen that can be done. Left click of the mouse moves Assil. Right click of the mouse is for doing the action shown at the bottom of the screen. Select an item from inventory at top of screen and right click to perform the action stated. A 'My to do list' is accessed by pressing Alt-tab keys. Another Alt-Tab will close the list. ESC keys accesses the menu. There are unlimited saves and they can be overwritten. 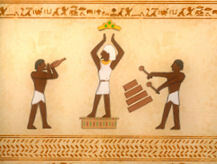 Assil and his 2 friends decided to have a party in one of his father's new pyramid. At the Scarab King's tomb, Assil breaks 7 urns and wakes a mummy. The mummy casts a death curse on him. He now wears an ankh ("at least we have a bottle opener") previously in the care of the mummy and curse marks on his hand. NOTE: Right click to do actions and left click to move and for information. Check everything so as not to miss funny quips in the game. You can do things differently from this walkthrough. 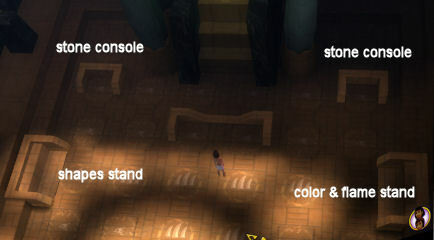 The walkthrough is just one sequence to the end and is arranged to answer one to-do item at a time. Double left click to make Assil run. Find a way out but not through the door. Home: Assil comes home and gets grounded for a week. In his room, one of the windows gets broken by men on the street. This gives Assil an idea. Look around. Right click to pick up the dirty shirt on his bed. A silver coin is also taken. Go to father's room right of Assil's room. Check the locker door (cabinet) and pick up brush without bristles under the big blue precious vase. Use (right click) the locker door. Pick up father's robe and automatically, the clothes hanger. Enter stairs at bottom of screen. Look at broken window at right. Look at extravagant hanging basket. In inventory, right click father's robe to dirty shirt to make improvised rope. Combine improvised rope on extravagant hanging basket. Freedom, here I come. Get back my single silver coin. Home: Meet 2 assassins, Tarok and Blackeye. Talk to them - select dialogues from bottom to top = (no - you cannot die, walkthrough needed, no boring puzzles, no need to save the game). Talk (right click) to Tarok completely. The louse is an assassin's faithful friend. They want to kill Assil's father, as ordered by the Pharaoh. They are hungry. Bazaar: Go down the road and enter bazaar. Talk to Volcano completely. Learn about the palace, guards, fish burgers and ferry. Have a chat with Fatima at the first left stall. You can also talk to the walking Old Lady. At the Banana stall across from the tailor, read the sign - closed due to illegal banana trade. Talk to the wine merchant at the stairs to upper market. See a woman being taken by a guard. Talk also to the slave master and his slave. Check the locked door of the Arabian Embassy. Olga's Fish Burger: Go right of the slave master and slave. Go to bottom right road to the lower market. Dinar, the sleazy merchant will talk to Assil. He wants the Ankh. Go down the road and talk to Olga at Olga's Fish Burgers. Note the hungry cats left of the stall. There are fishcakes, salad bowl and buns on the counter in front of Olga. Continue down to the right and see a drain going out to the Nile. There's a fish floating on the muddy water. Try to pick up the fish. It's too slippery. Go back up the road pass Olga and Dinar. Go through the archway (Enter road) above the slave master. Hear gossips from the slave master - slave conversation. You can pick up info from these gossips. At the end of the alley, pick up fishnet stocking hanging on a clothesline. Exit the alley by using the enter marketplace cursor. Go back to fish floating on the muddy water at other end of the road pass Olga. Use the fishnet stocking on stinky fish. Go back to Olga's Fish Burger. Pick up the metal bar holding the swinging door between Olga and the hungry cats. Use swinging door to allow the cats through and immediately pick up the salad bowl to get salad. Do it again and this time pick up bun. In inventory, combine bun, salad and then stinky fish to get fish burger. Go back down to the end of the road to the right. Take the road right of drain and enter home to get back to the assassins. This opens the enter Nile action on this road. Give the fish burger to Tarok and get your silver coin back. An adverse reaction to the fish burger occurs. Bazaar: Go back to the bazaar. Go further down the road and talk to the nearly blind tailor across from the banana-fruit stand. Talk about going to an optician and scissors. He will give you the blunt scissors. Go to the archway left of the muddy water and drain at end of lower market either by passing home or pass Olga's Fish Burger. Nile: Enter Nile. See the ferry and talk to Take Tut Cashun, the wise man. Go to moist stone with green scrape marks by waters edge between the post and the ferry boat. Combine blunt scissors with moist stone to get sharpened scissors. Go back to the tailor at the Bazaar and give him the sharpened scissors. He gives you a cursed needle and learn about the pirate, crocodile and the guards. Find a way to speak to the Pharaoh. Palace Gate: Go to the road above the slave master. Look at the sign at end of the road and see crocodiles prohibited. Enter forecourt and talk to the guards, who fear nothing. Continue to ask what they are not afraid of until a new dialogue about crocodiles dialogue happens. Talk to them again and go Crooooo...codile! They're afraid of crocodiles after the river pirates attacked the city. Nile: Go to the Nile and talk to the ferry man. Choose to find crocodiles from the second set of dialogues. Give the silver coin to the ferry man. Watch the crystal ball incident. Ooops! Pull the treasurer's arm and then pick up treasurer's arm. Open treasurer's hand to get treasurer's key. Go down twice at bottom of screen and use the key on locked chest. (Monkey Island!) Pick up pirate flag, compass without a needle, dirty statue and Captain's Hawaiian shirt. The crocodile won't let you pass. 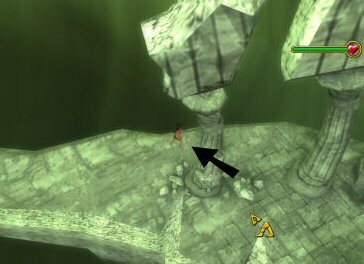 Use the metal bar on plank left of the statue with a missing arm. Pick up stone arm. The arm is so pale and naked. Use the Hawaiian shirt on arm to get stone arm in disguise. Use the disguised arm on crocodile and automatically pick up crocodile's teeth. Desert: In inventory, combine cursed needle and the compass without a needle to get a working compass. You would need the compass in the desert or you will get lost. At bottom right is a ferry icon that can get you back to the ferry without traipsing through the desert. Go right until Fish Burger sign. Remember this sign and think of it as your marker so as not to get lost at the desert. At this crossing, to the left of the sign is the way to the rock; while right of sign is the way to more desert. Go right to enter desert. Pick up the strange looking branch off the dead tree on the left and the skull on the right. From here, the way to Giza is forward and to the Sphinx is top right. Sphinx: That is the best looking Sphinx I've ever seen. Go forward and talk to Bakshish, the souvenir salesman. Learn about red scorpions and the competitions he sent to Giza. Note a paper umbrella on top of the basket to the right. Pan left, look at the right foot of the Sphinx and see a hand on the mechanism. 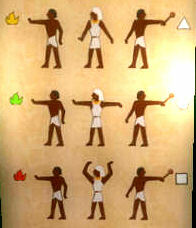 Go back to the crossroad (2 screens left) and go to Giza. Giza: See 3 men of the caravan left by their leader named Red Sea Aquarium and a Camel O Wash. Talk to the men (Far El Matu, Ras El Tin and Mut El Tebtyns). Ras El Tin wants you to wash his camel. He gives camel food. Look at the mechanism right of the entrance to the camel wash and see that it is missing the crank. Use the strange looking branch on mechanism. Place the camel food on bowl on floor of the Camel O Wash. The camel comes forward. Use the mechanism. Hahahaha! As a reward, a wine bottle is given. Pick up camel hair from floor of wash. Combine camel hair with brush without bristles to get brush with bristles. Exit area at left of the men and Giza poster to enter Rock area. Rock area: See a rock overhang. Go left and see another Assil appear. The present time Assil throws a rock to the 'Fata Morgana' Assil. Ouch! Go left and you won't go any further. Go back to the right and click on the ferry sign at bottom right of screen to go back to the ferry boat. Beach: Talk to ferry man. He will not take you back unless he gets paid. Give him the pirate flag which is something that might interest him. For that, he will give you free crossings. Talk to him again to back to Cairo. --- Get hold of some gold to purchase Fatima's treasure map. Bazaar: Go and talk to Fatima on the first left stall at the Bazaar entrance after Volcano. Ask what she has to sell. Fatima has a treasure map of the desert. In inventory, use the bristle brush with dirty statue to get a gleaming idol. Give the idol to Fatima to get treasure map. Look at the map in inventory. Go to tailor shop and look at sign 'last crocodile handbag sold. Talk to tailor about leather goods. Gentleman? Look for the old lady walking up and down the road. See that she is carrying the last crocodile bag. Talk to old lady. Pick up (click on) the crocodile bag she's carrying. Talk to her again until she gives over her handbag to get crocodile bag. --- Find the "treasure of the desert'. Nile: Use the ferry boat to go back to the desert. In inventory, look at the treasure map. 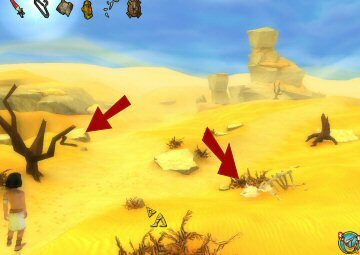 Desert: Go to Rock area, left of the Fish Burger sign. Go left of the rock overhang and left again to see a place in the map. 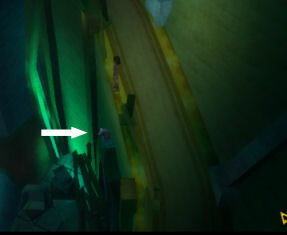 Stairs: Enter Stairs and go down to the bottom of the oasis. At the camp, talk to the 3 men - Shalom, Ephraim and Schmuel. Eventually, ask them to weave something for you - a crocodile costume. They need a few things. Give them the crocodile teeth, the skull and the crocodile bag to get a crocodile mask. Go back up the stairs, to the desert and click on ferry at bottom right of screen. Use ferry to go back to Cairo. Palace Gate: Go to the end of the road just before entering the Palace forecourt and use the crocodile mask. Enter the forecourt and watch the meeting with the fearless guards. Watch the meeting with the Pharaoh Tut-After-Noon. Prison: Look around at the gloomy prison. Talk to hole on left wall. Meet Gemotep, owner of the fruit stand in the market. You have to speak directly to Osiris and come through the back door. Look at rat's hole and take the rasp-file. Use the rasp on the knotted rusty chain right of the hole. The chained captain is lowered. Take his peg leg. You also get his flute. Use the hanger on the hole-Gemotep. He wants something in return. Give him the wine bottle. He returns the empty bottle for a deposit. Now, give him the hanger to get a VersaTool (doesn't that remind you of another game). Use VersaTool on prison door. Enter Prison door. Find the backdoor to the palace. Market: Enter marketplace and talk to Dinar the sleazy merchant at his luxury goods store. He wants a 'job' done first. Say yes. He wants you to break into the Arabian Embassy to steal the Sultan's Grail. The Ambassador's daughter is jailed. She was the one you saw taken by the guard earlier. Dinar gives Assil a badge to get pass the guard. --- Get the Sultan's Grail for Dinar. Arabian Embassy: Talk to the guard standing in front of the embassy door. Show the badge to the guard. SWAT = Snake Warning and Training. There's a 533 up there. Enter room and look around. Pick up the monkey rattle <wink> from left table. SAVE GAME. Now, do this continuously: Pick up Sultan's Grail and see the cobra. Use the rattle on Grail and entrance the cobra. Use the rattle on left window while the cobra is still gyrating. If the cobra goes back to the Grail before the window part, go down and pick up the rattle from ground or go back to the saved game to begin again. If done correctly, see the cobra in action. Pick up Sultan's Grail. Give the Sultan's Grail to Dinar at his Luxury store. He shows you the secret path. Enter backyard. Backyard: Look around the El' Buyall Import Export stall. Go forward to the small window left of the stall. Talk to the small window. She is the daughter of the Arabian ambassador. Learn what she said to the pharaoh. Agree to help her. Pick up Hurricane Termites on shelf right of the window. Go left and read the Tut-After-Noon's banana proclamation banner held by the statue. Pick up proclamation. Get past Bulbul the Bouncer. Go to top of screen to the inner backyard. Go left and talk to Bulbul the Bouncer. You're not groovy enough to enter. Learn all about Camella Loca: Once to the left, 2 to the right, turn once, clap clap. He needs music to dance it. Well, well, what is on his right - the trash pit. Go back to right screen and look at the storage room sign. Enter stairs to the cellar. Cellar: See a rotten beam holding the floor above. Guess what room is above. Use Hurricane Termites on rotten beam. Talk to milady Thara. She needs clothes. Give her the proclamation as her new dress. See the palace garden and a guard on the bridge. Find a way out of the palace bakery. Palace bakery: That's strange, it seems like Thara locked Assil in. Wonder why? Look around and see the millstone, jug and the Grill-O-Magic 3000 BC. Enter ladder on the left. Read the Grill-O-Magic instruction manual to make Ramses extra-long: flour, water and bake. Pick up grain from right sack. Look at the ledge on the right. Go down the ladder. Combine the grain on millstone to get flour. Place flour on the Grill-O-Magic. Use big blue jug. Watch the dough bake from - unbaked to ready golden brown to charcoal. It is best to pick the charcoal (hard as stone) form of the bread. Climb up the ladder again. Walk to the ledge at right corner of the screen. Look at gap over the water wheel. Combine the extra long, charcoal with gap. If you use unbaked or ready bread - watch out! You can bake a new one if need be. Use the charcoal bread on the gap to walk across. Hello! Assil sees the Pharaoh's daughter. Thara arrives in time. Wonder she's been? Note: The pictures of Thara and Assil are now at bottom right. You can change from one character to another by clicking on the picture or by clicking on the character on the gameplay. A whoosh sound is heard when the change is done. You can also give items to the other by 'use item on character'. It is best that you have the 2 character far apart to allow them to move around each other. Get Thara past the guards. As Thara in the Tower: Change to Thara and see that she has a brush with remnants of red paint in inventory aside from the flute. Go to the corridor on the right. Walk to the end and enter tower. See the guard blocking passage to the other side. Look at the banner at the window. Assil at Palace Garden: Change to Assil. Enter corridor and be at the bottom level right of the water wheel. 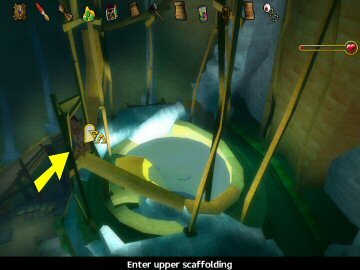 Use the lever right of the water wheel to lower the water level. The lever broke. Walk the formerly submerged bridge to the center island. Midway the bridge, see that the drain is installed too high on wall of the garden. Look at the 2 palm trees. Use the slim palm. Palace party garden: See Captain Pharaoh floating on the water. Assil can not pick him up. Let's check the party leftovers. Pick up the lobster at end of the right long table. Go up to the upper garden to see the pharaoh's main table. Pick up the fork stuck on the rightmost chair's back. Hear the guard lament about the party mess. Pick up curry powder spilled from jug on floor in front of chair with fork. Pick up the washboard off the floor left of the harp. Lookee here - finally see an unconscious Red-Sea-Aquarium, the leader of the caravan. We can't do anything for him yet. Use the lobster on the banner on the left. See Thara on the window. As Thara in the Tower: Change to Thara. Pick up the now untied banner. Enter gallery and walk to the left end. Enter corridor and be by the waterwheel. Walk to the center island via the bridge. Use the slim palm. She is not heavy enough and will not make it. Go back to the water wheel. Combine the banner on the waterwheel. The water rises when the water wheel was stopped. Walk Thara back to the tower at other end. Assil at Palace Garden: Change to Assil. Now that the water has risen, Assil can pickup Captain Pharaoh. Enter Gallery to go up to the corridor. Go left to enter tower. Walk to dark corner to hide. Now, use Captain Pharaoh. See the guard come and Assil runs to the garden. Use Captain Pharaoh again. Now the guard is away from the bridge. As Thara in the Tower: Change to Thara. Enter and cross the bridge to the other tower. Walk to the dark corner. The guard comes back to the bridge to his former position. Thara and Assil are together again. Move both of them to the right end of the corridor. Place one character over one of the floor plate. Place the other character over the other floor plate. The door to Osiris' Temple is now open. Enter the temple at right entryway. Temple Hall: Enter temple and walk to the right. 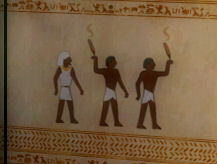 Look at all murals left to right: Fire; feather; colors and shape; flute and xylophone; and pharaoh. Temple Gallery: Both characters should go down to the middle of temple floor. Note that there are 2 incense (joss sticks) burners on the left (top and bottom) of the main temple floor. There are also floor tiles with either Eye or feathers. There are 2 small stands on either side (top and bottom) of the temple floor. Get Assil to combine-give the curry powder with-to Thara. Move Assil to the stand at top left and pick up the clapper. Move him to stand over the 3 feather tile in front of the stand. Get Thara to use joss stick on top incense stand left side of temple floor. The stand in front of Assil rises. Is that a sound puzzle? Get Thara to use joss stick on bottom incense stand left side of the temple floor. The stand on other end rises. Is that a color puzzle? Oh Yes he's silly! Move Thara to stand in front of the color puzzle. Be sure that she does NOT step on any Eye tile - just on feather tiles. If the eye tile is stepped on, the puzzle time is shortened. Get Thara to take the green powder from left pan and the yellow powder from middle pan. The red pan on the right is empty. Get Thara to combine yellow powder on flame. Change to Assil and get him to combine the clapper with the triangle gong. Change to Thara. Get Thara to combine green powder on flame. Change to Thara. Get Thara to combine curry powder on flame. Change to Assil and get him to combine the clapper with the square gong. Move Assil to stand inside the small stone console at top left of the main altar. Get Assil to combine fork and washboard. Change to Thara. Move Thara to stand inside the small stone console at bottom right of main altar. Get Thara to use flute. Move Assil to the center console. Osiris talks and gives Assil an artifact-emerald tiara to enter the underworld. Talk to Osiris. Here comes the Pharaoh. The Pharaoh talks to Ozzy. Watch the chase. Go through the left doorway. Pick up broken plate to lock the temple door. See what red paint did to the statue of Pharaoh's father. Run to the left until the tower. Exit through the window on the right. That scribbling, is that your work? Pick up the rope on the left. Oh No! My mother! Hahahahah! Listen to Osiris' talk about his plans for Assil and the Pharaoh. Assil and Thara part to go each own way. 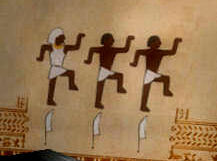 Assil's draws graffiti (message from Osiris) on the wall showing Osiris kicking Assil. 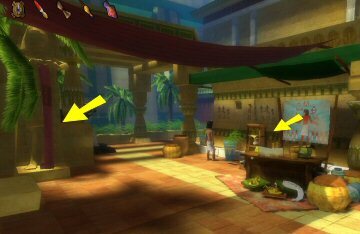 Enter market place and hear the slave master gossip about the disappearance of the Pharaoh's daughter. The slave master wants his banana drink and bananas are banned. Bring caravan leader Red Sea Aquarium back to his caravan. Nile: Talk to wise man. Note that Assil's mark has taken over his whole right arm. Assil has to go through the trial of the shadows. Assil would need the help of the Pharaoh. Use the ferry to go to the desert. Desert: Go to the treasure of the desert by way of the rock area left of the Fish Burger sign. Go left of the rock overhang. Far out -Stairs: Hear and talk to retired Genie. He dropped his lamp in the pond. Help the genie. Go down to the camp. Camp: See that the lamp in the pond is too far to reach. Talk to Thara. The revolutionaries are named The Children of Che Banana! Thara talks to the others to get Assil accepted as a revolutionary. Don't do anything stupid. Look at the nice guy! Assil is accepted. Assil's mark is now over his torso. Talk to the men about their secret. They gave you a plank. Go right to the broken bridge. Use plank on bridge. Enter path and go forward to the crack. Take the bucket under the first banana palm. Pick up banana bunch. Go back to the camp, up the stairs, desert and to the ferry. Backyard: Enter the backyard of the palace between the fish burger and Dinar's stall. As shown by the sign on his shop, Dinar is on a mission from God. Palace Garden: Go to Palace garden and enter through the entryway at top. Go midway that hall and down to the garden using the down arrow. Look at unconscious Red Sea Aquarium, the leader of the caravan. Combine the bucket with water from the pond. Combine the bucket filled with water with Red Sea Aquarium. He leaves to go back to his caravan. Help the genie get back his lamp. Slave Driver: Talk to the slave master about Sun of Cairo. Assil tells the slave master that he will talk to the brewer. Talk to the slave and learn that he is first class because he can read, write and swim. Bazaar: Go to the wine merchant at the stairs in the bazaar. Give the empty bottle back to the wine merchant to get silver coin. Talk to merchant about Sun of Cairo. Combine bananas with wine merchant. Ask for a Sun of Cairo that 'will totally knock me off my feet'. Give your silver coin (or if you still have the empty bottle) to the wine merchant. Get a Sun of Cairo. Slave Master: Give the Sun of Cairo cocktail to the slave master. He wants a cocktail umbrella with his drink. Oh Geez! Desert: Take the ferry to the desert. Take the way right of the Fish Burger sign. Go forward to Giza and see Bakshish, the souvenir seller catching red scorpions in the house. Go back and the exit to the right screen. Now, enter Sphinx. Go forward until the souvenir stand. Pick up the paper umbrella on top of the basket. Go back to the ferry and to the slave master at the bazaar. Slave Master: Combine the umbrella with Sun of Cairo to get Sun of Cairo with cocktail umbrella. Give the cocktail to the slave master. There you go! Take his bunch of keys. Combine keys with the slave. Talk to slave. Far-out Camp: Automatically see the slave take the oil lamp and give it to the genie. The slave gives his time machine to Assil. Get your reward from Genie. Ask him about everything. Learn about the pharaoh's daughter who is now at the Underworld. The way to the underworld is in the Sphinx. Talk to Thara. Go back to Cairo. Tell the Pharaoh where his daughter is. Forecourt: Talk to the 2 guards at the gate about the Pharaoh's daughter and about taking the risk. Palace: Enter palace. Nice statues. Go forward until you reach the Pharaoh. Talk to the pharaoh. He will give his daughter and half of his kingdom as a reward to get his daughter back. He gives the key to the Sphinx - hand of the locksmith. Outside of Sphinx: Take the ferry to the desert. Go to the Sphinx right of the Fish Burger sign. Combine the hand of the locksmith with the hand mechanism on the Sphinx' right paw. Enter Sphinx. Inside Sphinx: An Energy bar is now seen on the screen! Enter hall. Ouch! Someone threw a rock at Assil. The energy bar goes to red. Look around. Go to the right and bottom screen to see a pillar with dents. It is the unfinished ramp to the top on the right side of the great hall. See electric eels are swimming inside the aquarium at the middle of the great hall. Pick up and read memo 1 from top of the crate in front of the electric eel aquarium. The mummy is missing. Go to left side of great hall. Look at tracks in the soil - very interesting formation of lines. Pick up the hammer leaning on left wall above the tracks. Go to bottom of screen and climb up on the left ramp. Pick up and read memo 2 lying on one of the post's shelf. The switch is on the wrong wall. Continue up and look again at the electric eels at the aquarium. Take the right ramp going down to the unfinished end. Look on the edge and see a sack of concrete on top of the doorway. It is unreachable. Combine the hammer with sack of concrete. The sack falls off. Continue down the ramp. Look down and see memo 3 lying on the plank. Assil can't reach it. Go back to the top of the ramp. Walk around the rim of the aquarium and enter the upper scaffolding. Climb up and enter the head of the sphinx. Head of the Sphinx: Look at the stand to the right. It has a nose depicted on it and a keyhole the shape-mold of a nose. Look at the nostril hatch on both sides of the nose stand. Look at the stand on the left and it has round hole. Pick up the canned figs on top of crate at abandoned lunch place left of the circular ledge. Top of Great Hall: Go back down to the water top. Combine bucket with water to get bucket filled with water. Go back down to the floor of the great hall using the left ramp. Inside Sphinx: Go to the right side of the Great Hall and pick up the sack of concrete. Go to the left of Great Hall and to the tracks on the soil. Combine sack of concrete with tracks in the soil. Then combine the bucket filled with water with tracks filled with cement. Pick up cast form. Go to right side of Great hall. Combine cast form with pillar with dents. Use pillar with dents. Use ladder. Pick up and read memo 3. The exit nose key was with the memo. Assil's father has the other key. --- Get the locksmith's key. Head of Sphinx: Go down the scaffold. Climb the left ramp. Climb up to top of Great Hall. Climb up the upper scaffolding to the Head of the Sphinx. Use nose key on nose keyhole of the right stand. Dinar appears. I'm so sophisticated. There goes Dinar. Watch the bed of nails incident. Go back to the ferry. Home: Go back home and see the 2 assassins talking to Assil's father. Talk to Tarok. Father, don't call me Junior! Talk to Father and learn that he forgot where the key is. See the picture of the locksmith. Uhm, no hand, no nose. Eh, one eye only. Enter home and go to your bedroom. Enter stairs to go up. Look at the costly pillar on the right. Look at the construction at the bottom. Use lever and see the secret compartment. Go down to the main room and examine the secret compartment. Take the eye of the locksmith key. Talk to Father again. Sphinx: Go back to Sphinx in the desert. Use the hand key on mechanism to enter the Sphinx. Enter Hall and climb to the top to get to the Head of the Sphinx. Head of Sphinx: Go to the eye stand on the left. Use the eye of locksmith key on mechanism. Use the cord that dropped down. Hahahahahahahaha! Aquarium: Go back down and enter the scaffolding. See that the water is drained. Enter descent (yellow ramp going down the aquarium). If Assil mentions about looking at his health condition. It's time to eat. Head of Sphinx: Go back up to the Head of Sphinx. Combine canned figs with nostril right of the nose stand. The bed of nails slashed the can. Enter nostril. Pick up tasty figs. Use tasty figs. See that your energy level is to the max. Aquarium: Go back to the top of the aquarium. Enter descent. Bottom of aquarium: See an electric eel on the floor. Pick up electric eel. Combine electric eel with time machine, thus charging the time machine. This Assil went back in time to see the other Assil. The scale weight thrown by the other Assil is in inventory. Look at the stone pedestal left of the yellow doorway. See that it has a weight inserted. Go to the stone pedestal the right of the yellow doorway. Combine the scale weight with stone pedestal. The yellow door opens. Enter gate. Under the sphinx: Look around and see a sarcophagus at middle of room, a red button and a strange construction at left of room. Go back to right of room and pick up the baseball set. The baseball set is made up the bat, cap and baseball. Hah! Talk to the mummy and learn about the strange construction. He's going to test the red button. Go left to the strange construction. Assil will stand on the strange construction. Use construction. Bye, Bye! It's pitch black in here at the underworld. Use the emerald tiara. Go down and enter bridge. Meet the Hell Jackal. Combine the baseball with the Hell Jackal to play catch. NOTE: If the wrong answers stop the progress of the game, ask again. There are no dead ends to the game. Persuade the door to let me in. Gate: Enter gate. Look at gate. Enter teeth. The gate will talk. Talk to gate by placing the cursor on his nose area. His memory is shot. Go to the stone area on the right. See a broken fuse and lid. Use lid. See that there are clamps for fuses to connect the blue eyes, red memory, yellow thinking and green ears. Pick up the fuse from yellow thinking and place it on the red memory. Go back and talk to gate. Who are you anyway? "My dear door? If you'll let me through, we could be friends". Come on in and make yourself comfortable. Stairs: Enter stairs. See Pharaoh's daughter, Osiris and Dinar. Wait a minute. Will you lift my curse in exchange for the Ankh? You know what? Then I'm not gonna give you the Ankh! I have a feeling that I shouldn't give up without a fight. Continue to talk to Osiris. Thara has arrived in the nick of time. Where's your left sandal? Assil chases Thara. Move Thara to the left and behind a broken column. Oh No! Assil! Activate the Ankh. Select the last dialogue - Isis gave the ankh to Ra, Ra gave it to Osiris, Osiris gave it to Seth and Seth gave it to the pharaoh. Thara offers to have her soul weighed. Watch the weighing on the scale. Osiris is not happy. Try to find a way out but eventually, Assil takes over from you. In front of the Sphinx: Push Bakshish. Shall we? My pleasure! At the Palace: Watch Assil and Thara stand in front of the Pharaoh.